Portland students at Roosevelt High School in North Portland, Lincoln in Southwest, Cleveland in Southeast, Franklin in Mt. 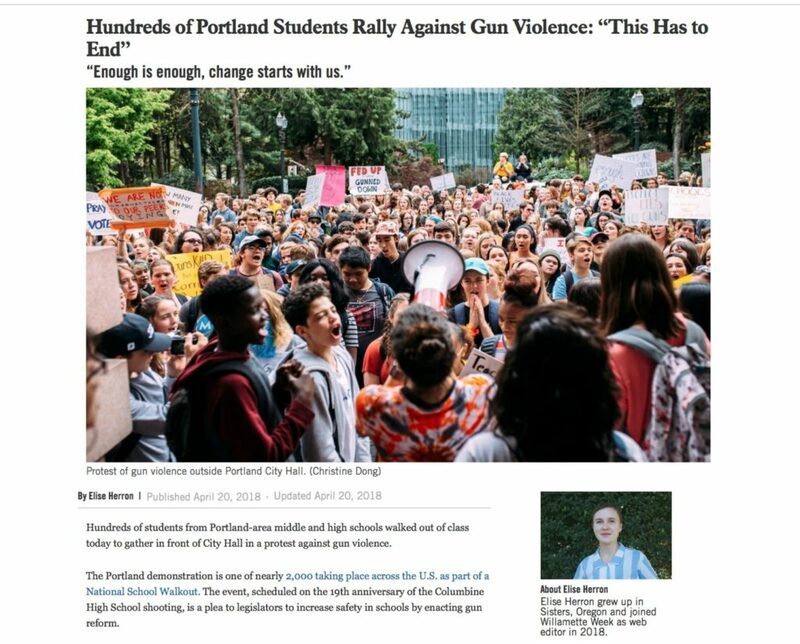 Tabor and Sunset High in Beaverton were a few of thousands around the state, and nation, protesting for an end gun violence. Many of the morning’s demonstrations included sitting for 17 minutes in silence—one minute for every person shot in the Florida school shooting. At Lincoln High, where Mayor Ted Wheeler was present, 17 desks were situated with 17 roses on them. It was followed up by another one in April in which students were given time off to protest. 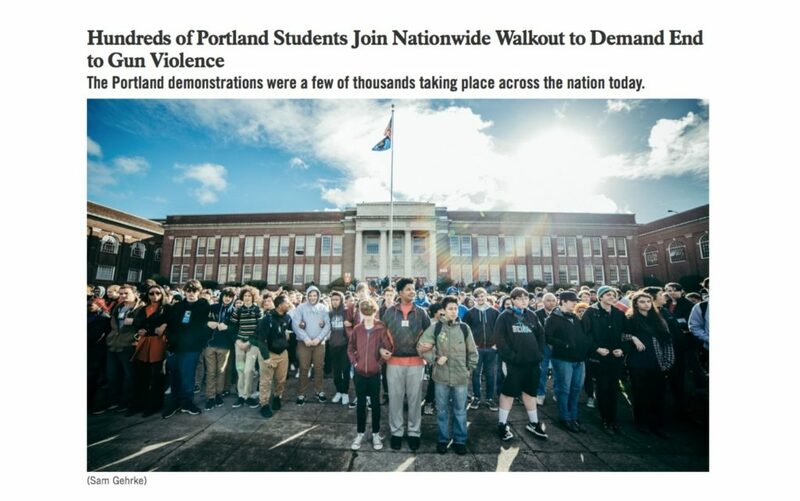 Portland’s protest community, or as I call them Portland Professional Protesters, Incorporated,™ permeate the community, especially in government – teaching – and quasi government non-profit jobs. I wouldn’t be too far off in suggesting that they leave school on Friday afternoon to join a drum circle by 4pm and then don a balaclava for the evening’s Antifa destruction. There is no chance they don’t bring their far Left politics to the schools. No chance. This is the state that adopted the law – offered by a teacher – to register underage voters. They call it “pre-registration.” Gee, I wonder what political organization they align with. In response to a Public Records Act request, PPS has now released documents showing that the demonstrations were organized by PPS, and involved a massive dedication of school resources. From the School Board (which passed a resolution calling for a ban on the possession of all semi-automatic weapons) on down to the individual schools (which reprogrammed class bells to create a special protest period, so no one would have to be marked absent from class), the entire Administration organized itself to undermine the core of our Constitutional republic. [Buchal] is seeking PPS parents and students who are willing to step forward and serve as plaintiffs in a lawsuit seeking to enjoin PPS from further political indoctrination at taxpayer expense. Buchal told VictoriaTaft.com that, so far, no parents have stepped forward to be plaintiffs in the case, but Buchal says they can reach him at jbuchal at mbllp.com. That’s not what teachers are supposed to be doing. This is why we have so many people home schooling their kids. The enemies of freedom are devious! We have been duped into paying for the brainwashing of each generation through tax funded, Democrat dominated K-12 an Liberal Arts colleges. Educational Freedom and Parental Choice is the answer! How? Glad you asked. Through Universal education vouchers, (education dollars follow the student)t. Tax exemptions for privately funded education & job training. Power to the Parents, not the bureaucrats and government union lobbies. Sadly, you’re right about this. If one dime comes from the state to this school then all Oregonians are plaintiffs. We need more people willing to stand and be counted without counting the cost. I wonder if that’s a thing under the law. It sounds good, though. You are missing a share button. You only have a like button. I’ll have to work on that. You can share it the old fashioned way by copying the link. I’ve got a feature photo that shows up as if you had a share button. The share buttons work now. I call for firing all the people that took place in this fiasco. It’s a waste of my tax money. Pure and simple. Shame on the school board for letting this happen and not taking action. If I was a parent you would have a law suit. Let’s hope some parents with kids in the district stand up to be heard. They might be so brow-beaten by the political group think going on in Portland and many other parts of Oregon, but I want them to know that their instincts are true: this is wrong. Do you have to be a parent, or just a taxpayer, to be a plaintiff? Seems like they’re robbing every taxpayer. You might have standing. I think James Buchal would have insight into that.